BAE Systems has received a Phase 2 contract from the Office of Naval Research (ONR) to develop an electromagnetic (EM) railgun under the US Navy’s innovative naval prototype (INP) programme. Under the $34.5m deal, the company will design and develop the EM railgun while the initial prototype launchers are expected to be delivered to the US Navy by 2014. Phase 2 of the programme aims to enhance the railgun technology by integrating auto-loading and thermal management systems, as well as by maturing the launcher and pulsed power from a single shot operation to a multi-shot capability. BAE Systems Weapon Systems vice-president and general manager Chris Hughes said the company would develop the technology, which is predicted to revolutionise naval warfare for the US Navy. "The railgun’s ability to defend against enemy threats from distances greater than ever before improves the capabilities of our armed forces," Hughes said. "The railgun’s ability to defend against enemy threats from distances greater than ever before improves the capabilities of our armed forces." In 2012, engineers at the Naval Surface Warfare Center in Dahlgren, Virginia, US, have conducted test-firing of the BAE-built EM railgun prototype at tactical energy levels and demonstrated its capability, as part of Phase 1 of the INP programme. The EM railgun long-range weapon system is capable of launching a projectile further and faster to hit the target using high-power electromagnetic energy instead of explosive chemical propellants. US Navy forces will use the railgun to support a wide range of missions, including precise surface fire support or land strikes, cruise and ballistic missile defence, as well as surface warfare to deter enemy vessels. Work under the contract will be carried out by BAE in Minneapolis, Minnesota, US as well as by its teammates IAP Research in Dayton, Ohio, and SAIC in Marietta, Georgia, US. 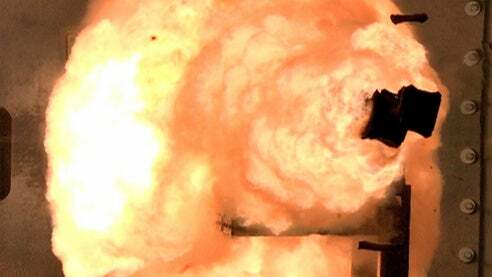 Image: BAE-built prototype EM railgun launches a projectile. Photo: courtesy of BAE Systems.